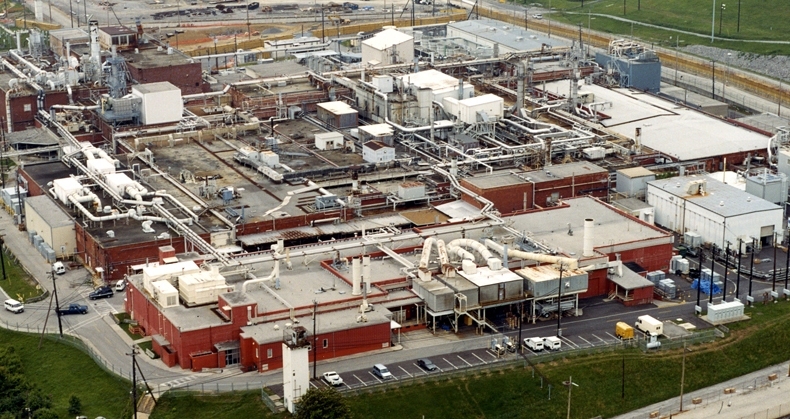 In a newly released activity report by staff of the Defense Nuclear Facilities Board, it was noted that a Y-12 engineer received contamination on his forearm when a “drop of process solution” dripped from overhead in the C-1 Wing of Building 9212 — the plant’s main facility for processing highly enriched uranium. The report noted that even though the non-destructive assay engineer was wearing the appropriate protective clothing, the acidic solution soaked through the nylon cloth and resulted in skin contamination. The first attempt to remove the radioactive residue was apparently not fully successful, but a second effort “reduced the (radiation) readings to less-than-detectable levels,” the safety board staff reported. The drip of uranium solution reportedly came from the connection between a drain valve and a section of tubing. The same report, dated May 9, also noted a “separate but similar event,” which involved a maintenance worker on a scaffold in the B-1 Wing of 9212 who identified some “discoloration” on the forearm of his protective coveralls. “With the support of radiological control personnel, the worker doffed his PPE (personal protective equipment) and discovered skin contamination on his forearm.” The report said, in this instance, the contamination levels were lower and easier to remove than the other incident at 9212. A fact-finding effort was expected to address the issues. “Building 9212 is 71 years old and the processing equipment requires continuous maintenance to keep it operating safely. CNS Facility Engineering personnel have closely tracked and pursued repairs of identified leaks. A feature on Atomic City Underground allows readers to sign up for email updates and receive a notice each time new information is posted. Just put your email address in the box on the lower right of the blog’s front page and follow instructions. Thanks to all loyal readers. This entry was posted in CNS, uranium, Y-12 on June 21, 2016 by Frank Munger.